One of the many curious things I remember about my childhood is corned beef hash, an odd dish of potato and corned beef served up on those nights when mum seemed to have run out of inspiration. It was always made of mashed potato, with corned beef similarly mashed right into the potato, then fried until burnt on the bottom. We ate it with too much salt and disappointed faces. Leading up to this point, there was always The Accident, wherein somebody, usually my dad, would attempt to open the can of corned beef with an unusual amount of enthusiasm, and consequently and somewhat inevitably, cut their hand to ribbons on the razor-sharp edge and spiral of wire, a coiled accident-waiting-to-happen. Often, the can just wouldn’t open because of shoddy workmanship causing the all-important key to break off, which then led to ever more treacherous attempts to open the stupid can with whatever was to hand. ‘Whatever was to hand’ rarely included a can opener, but there was always a hammer and sometimes a screwdriver. I realise now that that corned beef hash was cooked all wrong, that it’s a far better dish if the potatoes are left slightly firmer and just crushed to break them up, that a burnt base isn’t a particularly good addition, and most of all, if you use proper corned beef, corned beef that doesn’t come out of a lethal can. The big problem with this ‘do it properly’ approach is that ‘doing it properly’ means making your own corned beef. This takes time, a little planning, perhaps a little Internet shopping, but it can be done, and it’s a great introduction to curing and preserving meat. Corned beef is just brined beef brisket, and brining is one of the simplest methods of transforming cheap cuts of meat into something quite sublime. The biggest logistical problem in doing this is fridge space. A 2.25kg piece of brisket is a big chunk of meat, and it needs to sit in a container big enough to hold four litres of water as well, and all of that needs to fit into the fridge. If that’s a problem, scale the size of the beef joint down, but be careful to maintain the ratios in the brine mix, so that it’s the correct strength. Best to make the whole batch and only use what’s needed. So, this is simple. Beef, big container, brine. Wait a few days. Cook. First, the cut of beef. Brisket is the key … well-marbled, brisket, a cheap cut of meat that’s normally at home in a long, slow casserole. You get a lot for your money with brisket, and cured and cooked slowly, it’s a wonderful cut. It’s worth choosing a big piece, because corned beef keeps quite well, and leftovers can be frozen and used later. This recipe i for 2.25kg of brisket, but I wouldn’t do this with a piece of beef that weighs less than 1.5kg. Secondly, the brine. Add 450g of salt, 100g of sugar, three cloves of crushed garlic and 25g of pink salt/Prague Powder/Instacure #1, or whatever name sodium nitrite is sold under these days (here’s a British supplier), along with 20g of pickling spices to four litres of water and bring it to a simmer, stirring so that the sugar and salt dissolves. For the pickling spice, a shop bought one is fine, but a DIY effort is even better. Toast 20g each of coriander seeds, mustard seeds and peppercorns in a dry frying pan, then lightly crush them in a pestle and mortar. Add 12g of chilli flakes, 14g of allspice berries, 8g of ground mace, two small cinnamon sticks, broken into pieces, 6g of whole cloves and 8g or ground ginger. Mix the whole lot together and store in a jar. Let the brine cool completely and then pour it over the piece of brisket, until the meat is completely covered. Use a plate to weight the meat down, to keep it under the brine, and refrigerate for five days, turning the beef over after a couple of days. A quick note on the cut of meat – brisket is normally sold rolled and tied very tightly indeed. For a small piece, that’s fine, but for a large, thicker piece, it’s possible that the brine won’t be able to penetrate right through to the centre of the tied joint, which is the whole point … the meat needs to be entirely cured to achieve that characteristic pink tinge. leave the meat in the brine for longer, with the obvious disadvantage that it’s taking up fridge space, and well, takes longer. Option 4 is the best, Option 2 the simplest. After five days, remove the beef from the brine and rinse under cold running water, then transfer it to a large pan, cover with fresh water, add another 20g of pickling spice and simmer very gently for three hours. The beef should be extremely tender. 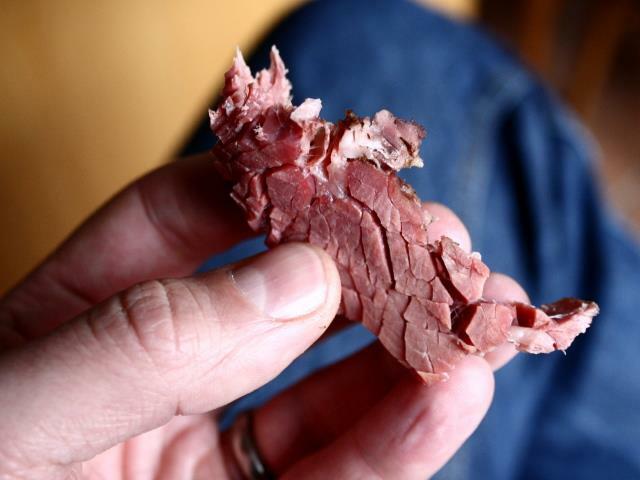 It’s great sliced and served warm, but even better when allowed to cool and sliced for sandwiches, or cubed and fried as part of a proper corned beef hash.
. There’s no better place to start if you’re interested in preserving meat. That is fascinating. The picture bears no resemblance to the nasty stuff in a can that I too suffered as a child – and as a student! So why is it called ‘corned’ beef when the only ‘corn’ seems to be peppercorns?! I should’ve talked about this in the post, but the term ‘corned’ comes from the use of salt ‘corns’ to cure the beef … large grains of rock salt are apparently called ‘corns’. I really liked the burnt bit on the bottom of Mum’s corned beef hash! I like making bubble and squeak, for which a burnt bit is also essential. With enough HP sauce it’s a taste sensation!